Kim Skala Named 2011 POCC of the Year! The CPOCT Awards Committee has announced that Kim Skala, MT(ASCP) Point of Care Coordinator ACL Laboratories, Advocate Christ Medical Center & Hope Children’s Hospital, Oak Lawn, Ill., has been named the 2011 POCC of the Year. Kim, will receive the award during the CPOCT Division Mixer on Tuesday, July 26, during the AACC Annual Meeting and Clinical Lab Expo. Kim began her career at Advocate Christ Medical Center in 1981. Advocate Healthcare includes 10 acute care hospitals and 2 children’s hospitals and is recognized as one of the nation’s top 10health systems. Kim has been involved with POCT since 1998. The program at her site has grown to 20 POC tests and approximately 2700 operators. Kim is involved with numerous multidisciplinary teams including the Culture of Safety Program, Diabetes Management Task Force, Performance Improvement and the Advocate System-wide Patient Identificatio Team. 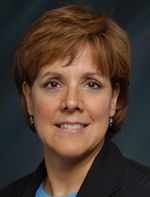 As part of ACL Laboratories ( a joint venture between Advocate (IL) Healthcare and Aurora (WI) Healthcare, she co-chairs the ACL POCT Technical Advisory Team and is involved in system standardization across multiple test platforms and information systems working to meet the diverse needs of caregivers and patients across two states and 22 hospitals. Kim has been an active member of the Tri-State POC Network since its inception in 2001. She is a speaker on POCT for CLS students and current laboratory professionals. As a member of the CPOCT Division, Kim enjoys the AACC Mentoring program. Kim was a presenter at the AACC Annual Meeting in Chicago (2009) for the POCC Forum and has contributed articles to several professional publications. At the 2010 AACC International Point of Care Symposium in Boston she presented an abstract on reduction of patient identification errors. Last updated: 11/13/2014 Questions or corrections: My Point of Care.net.© 2008 Medical Automation Systems, Inc. Legal Notice.